The above photo is from an unknown source. Below is a photo from the Marlborough College Roll of Honour. 4th Battalion Yorkshire Regiment. Son of Horace and Ida Darwin, of The Orchard, Cambridge. Grandson of naturalist Charles Darwin and statistician Thomas Farrer, 1st Baron Farrer. Died 24 April 1915. Aged 33. "The son of H Darwin Esqr F.R.S. of Cambridge, and grandson of Charles Darwin and of the 1st Lord Farrer, was born on 7th December 1881 and was at Marlborough College (Cotton House) from September 1895 to Midsummer 1901. He became an Exhibitioner of Trinity College, Cambridge, in 1902 and was Senior Optime in 1904. From Cambridge he went through the Shops of Messrs. Mathers & Platt of Manchester, and at the outbreak of war was Secretary of Bolckow Vaughan & Co. Ltd. of Middlesbrough. In September 1914 he was gazetted 2nd Lieutenant in the 4th Battalion .. Yorkshire Regiment, with which he crossed to France in the Northumbrian Division in April 1915. This Division was almost immediately engaged in the Second Battle of Ypres. Erasmus Darwin was killed during a successful attack at Fortuin near St. Julien on 24th April 1915." The following biographical information is taken from Robert Coulson's "Biographies of Yorkshire Regiment Officers";-"Erasmus Darwin was the grandson of Charles Darwin the renowned naturalist and was born in Cambridge on 7 December 1881. He was educated at Horris Hill, Marlborough College and then Trinity College at Cambridge where he specialised in mathematics and mechanical sciences. He then worked for Mather and Platts in Manchester, the Cambridge Scientific Instrument Company and at the outbreak of war was company secretary for Bolckow and Vaughans Ironworks in Middlesbrough. Erasmus Darwin spent just six days on the Western Front before being killed. The 4th Battalion landed at Boulogne on April 18th 1915 and were immediately moved up to the Ypres Salient. At 1-00am on April 24th the battalion were by the canal to the east of Ypres and later in the morning they were ordered on to Potijze. From here they advanced through the wire in an attempt to push the Germans back into St Julien. 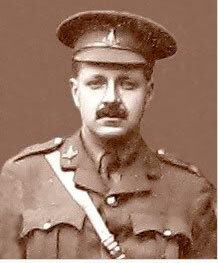 2nd Lt Erasmus Darwin died in this action on April 24th 1915 at the age of 33."